SuperNotecard is modeled around the time-tested technique of using 3 x 5 notecards to organize and prepare written compositions. Traditionally writers used notecards to record facts, jot down ideas, or sketch out dramatic scenes and then organize them. The organizational process includes shuffling the card order, categorizing cards with stickers, and manually creating relationships between cards. Some writers get fancy and use colorful rubberbands, cork boards with decorative pins, or cards without the lines. The intent of this app is to take the traditional approach a few steps further. SuperNotecard exports to several file formats, offers search tools, an intuitive, visual categorization mechanism, character profiling, reference databasing, and makes it easy to flag and notate content for later revision. SuperNotecard is part outliner, part word processor, and part content manager: everything writers need to bridge the gap between a handful of good ideas and a formatted manuscript. SuperNotecard introduces a variety of elements that you can combine in a way that works best for each project. Not all elements or features are relevant to every project. From this perspective it will be easiest to assume that there is no right way to use this tool; rather, there are many ways to use SuperNotecard and many ways to leverage its capabilities to improve your creative process. The Project is central to SuperNotecard. 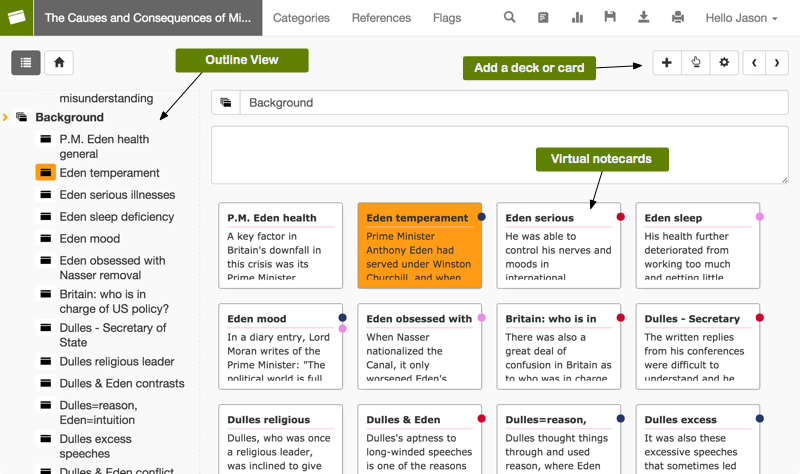 SuperNotecard supports four types of projects: Fiction, Non-Fiction, Script and Flash Card. All projects are composed of individual cards arranged into decks and organized by a set of custom categories. As we will explain later in this document, cards can be linked to other project elements, like References and Details, and also flagged and annotated. To start your first project, press the ‘Start a Project’ button. If you already have projects from the old desktop version of SuperNotecard, you can press ‘Import Project’ to bring them into the new online version of SuperNotecard. With a new project, the first question is ‘what type?’. The project types do not differ significantly with respect to the basic building blocks of decks and cards; however, they do have a few unique features: script projects include a timing tool and simpler line spacing. Non-fiction projects lead with bibliographic reference type choices. Flash Card projects can be launched to randomly present card titles with the option to view the rest of the content, much like how students traditionally use notecards to study vocabulary words. The main components of any project are the decks of cards. Press the Project icon button and select Edit to display the deck and card contents of your project. When viewing the contents of the project or the contents of a deck, you are in what we call the “Deck Display”. For a new project, step one is to add a card or deck. Press the ‘plus’ button in the upper-right toolbar. Your choices will be to add a card or a deck. Remember that a card contains the basic content of your composition. For instance it can contain a fact or quotation from a source or might be a specific scene or segment of a novel. Decks provide a way to combine cards and can represent a chapter, section or logical grouping of facts. Compared to cards, decks have a shadow effect to appear taller. Decks also have a number in the lower right representing the count of items inside. One you have a few cards and decks to experiment with, press a card twice to display and edit its content. Press a deck twice to drill down into the contents of the deck. Here’s a Tip: To quickly edit the card or deck title, press just the title twice. How to change the Card or Deck color? As with any project item, change the color by selecting the icon to the left of the title editing box. A color choosing window will appear. Select the color and press Save. In the deck or card toolbar there are a series of buttons aligned across the top, beginning with the outline and home buttons. If you are inside a deck, you will find other buttons immediately following the home button representing the hierarchy of decks situated between “home” and the current selected deck. Press any of these to jump to the item named by the button. 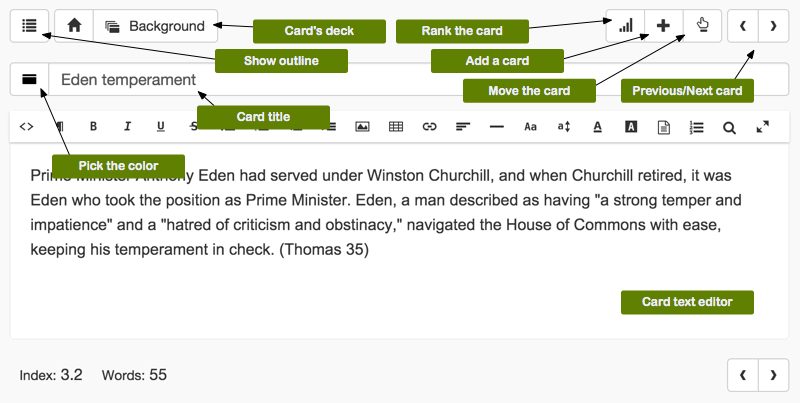 Press the Outline button in the navigation bar for quick access to every card and deck in the project. The currently selected project item is specified in the outline with an arrow. Locating cards and decks by keywords is easy with the SuperNotecard search tool. Select the magnifier icon in the upper right and enter a search phrase to produce a list of cards and decks that include the phrase in either the title or the body of the item. Select case-sensitive to further limit the results. SuperNotecard also includes a powerful Find & Replace tool to help adjust words or phrases across the project. Press the Find & Replace button at the bottom of the search dialog to engage the tool. Much like real, three-by-five index cards, the cards in SuperNotecard are arranged in decks. Every deck includes a title and a description and can be given a unique color. They can naturally include cards but also other decks. Select and position an individual element on the screen with the mouse (or finger) to reorganize the contents of a deck. With an element selected, hold the mouse button down and drag it to a new location. Choose a location between elements or choose another element: choose another card to move the selected element after the card, or choose another deck to move the selected element into the deck. Organizing your cards and decks and modifying how you visualize them plays an important role in successful writing. SuperNotecard has a variety of options to help. To get started press the ‘gear’ button located in the upper right of the deck display. In the first section of the options is a list of pull-down menus that control which card markers show in the display. 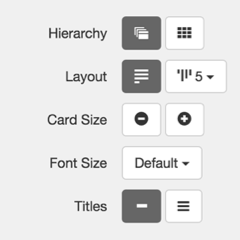 In the second section of the deck display options you have a variety of controls that determine how to display the heirarchy, layout, card size, font size, and titles. Hierarchy – Set whether to display the hierarchy in your project where decks appear and reveal the cards that they contain, or to ‘flatten’ the project and just show every card, regardless of whether they are organized into decks. Layout – Pick from Wrapping Layout, where cards flow from left to right and then down into a sequence of rows on the page. Or, pick from Column Layout and choose the number of columns. In this layout items are organized into vertical columns. The sequence in the project follows all of the items in the first column and then moves on to the next from left to right. 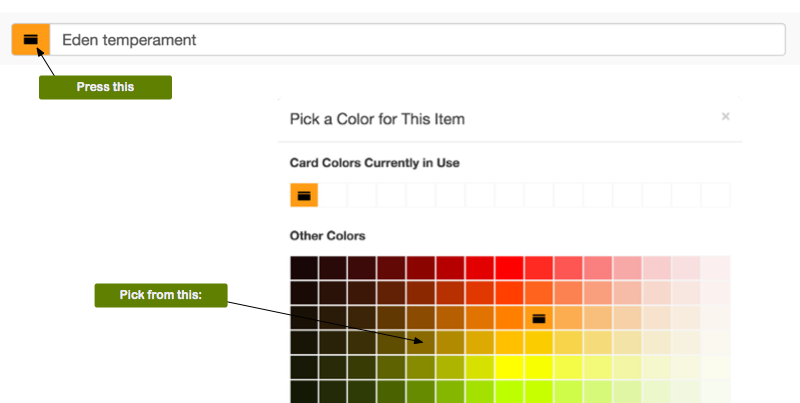 Card Size – Press the buttons to either increase or decrease the size of the cards in the deck display. Font Size – Choose the desired font size for the items in the display. Titles – Press the Single Line button to use just one line to display the items’ titles. Press the Multiple Lines button to display the entire title on as many lines as necessary. In SuperNotecard the basic building block of every project is a card. A card is logically synonymous with a paragraph. It can also represent a fact or capture a scene, etc. Each card has a title or summary statement and content; it can belong to one or more categories, and can have a flag with notes. Cards can also have relationships to References and their respective details. Add a new card by pressing the ‘plus’ button in the upper right of the deck display or card. While in the deck display you can also click or press within an open space to quickly add a card. This is especially helpful when your Deck is arranged using the Column layout. To start to add details to your new card, click or press the card twice. With the card loaded, enter the cards title. If you want your new card to have a different color, select the icon to the left of the card title edit box and choose a color. Next move down to the large text editor to enter the main content of the card. Quality text editing is an important improvement in the online version of SuperNotecard. In this latest upgrade, writers can format their text with bullets and tables, embed images, add line numbers and links, apply a variety of styles and search for text. Cards that require follow-up or represent a unique point in the writing process can be flagged. To flag a card from within the card display, press the ‘plus’ button in the box labelled “Flag for Follow-up.” In the dialog that follows, select the flag color and add any important notes. 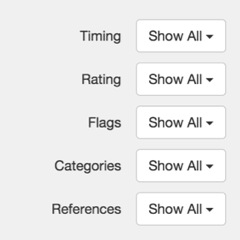 All flagged items are listed in the Flags area of the project which can be visited by selecting “Flags” from the top menu. Cards can belong to one or more Categories. Press the ‘plus’ button in the box labelled ‘Categories’ to choose an existing or to create a new category to attach to the card. To remove an existing category assignment, press the category icon button and select “Remove this Category”. Often it is beneficial to create relationships between cards and the references that provide the foundation for the content. References include characters, places, symbols, research sources like books, journals, magazines and articles. These relationships provide a convenient mechanism for visualizing and refining your project. The primary goal will be to help SuperNotecard identify all the cards that relate to our major character Jonah, or that reference our academic journal about Fleas. Press the ‘plus’ button in the box labelled ‘References’ to choose an existing or to create a new reference to attach to the card. By default SuperNotecard suggests possible references by looking for reference keywords in the content of the card. When writers create references they have the option to define keywords for this purpose. For example, you could define a keyword like NYT_NOV_11 for a New York Times article published on the 11th of November and then include this keyword when working a quotation into a paragraph (on the card). When you press the add references button, this article will appear as a likely candidate. Keywords are created and maintained in the reference detail area. To further define a reference’s relationship to the card–like attaching a source page number or a specific character biographical detail–press the icon next to an entry in the references box and select “Add Reference Details.” In the dialog that follows choose the appropriate detail. All of these relationships can be described with notes in the provided text area. Tally the duration of each card or scene with the scene timer. To start the timer, press the start button press the square stop button to stop the time. Press the time to specifically enter the minutes and seconds. The deck display will compute and display the total time for the deck as well as show the individual times for each element. SuperNotecard enables writers to separately collect and organize items that their cards reference. References include characters, places, symbols, research sources like books, journals, magazines and articles. References can be color-coded and can include specific details depending on the type. To define references in the project, select the References tab from the top Project Navigation Bar. Press the ‘plus’ button to create a new reference. Start by entering the title and a description. Next, choose the type from the adjacent drop-down list. Click the icon button to color-code the reference. All types of references can be included in any type of project. For example, a place such as Hibbing, can be created and used in a non-fiction biography project about Bob Dylan. Likewise, many traditional sources, like books, articles and photographs, would be important to a fiction project about the Vietnam War. Next you add reference details. Click the ‘plus’ button in the Reference Detail box to add a new detail. In the window the follows you’ll find detail possibilities on the left, and the ones that you’ve created on the right. The possibilities will vary based upon the type of Reference. Naturally a book reference will include details like ‘Title’ and ‘Author’ while a main character will have details like ‘Bio’, ‘Fear’, ‘Back Story’ or ‘Trait’. Another important step in creating your Reference will be to define one or more keywords. Keywords are required in order to locate and attach cards that are related to the reference. For research projects this is the way to list all cards with facts recorded from a particular source. In a fictional work, this feature will make it easy to locate every reference to your protagonist, Jim.